^^^^ Excited me wearing my mermaid tail for the first time! Not that you can actually tell I’m excited from the picture. Sort of funny story, when I woke up the morning these pics were taken on, I went out into the kitchen where my mom was on the laptop and asked her to check where my mermaid tail was. The tracking site said it was . . . on our front porch? We though there must have been some kind of mistake, because my mom hadn’t seen a FedEx truck go by, and we were expecting it to arrive in the afternoon. But no — I dashed to the front door, pulled it open, and propped up against the wall was a flat cardboard package. It had arrived! That’s awesome! 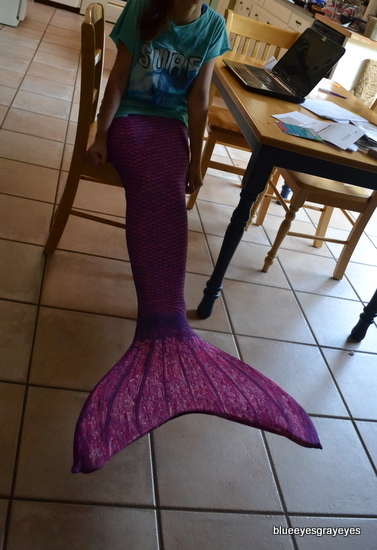 I didn’t even know that you could buy mermaid tails…but it’s really cool! I might enjoy swimming a bit more if I had one of those, haha. Is it hard to swim in that?